MAC staff have decorated the museum with three massive Lego minifigures — all made locally. Who doesn't have fond memories of hours spent building with Legos? The tiny plastic building bricks are a staple of modern childhood playtime, and for many avid collectors and master builders — like Sean Kenney — that love of Legos has extended on into adulthood. Kenney's artwork made with Legos is featured in the latest exhibit, Nature Connects, coming to the galleries of the Northwest Museum of Arts & Culture. A display of unimaginable scale, the exhibit features 28 massive Lego sculptures of plants, animals and insects. 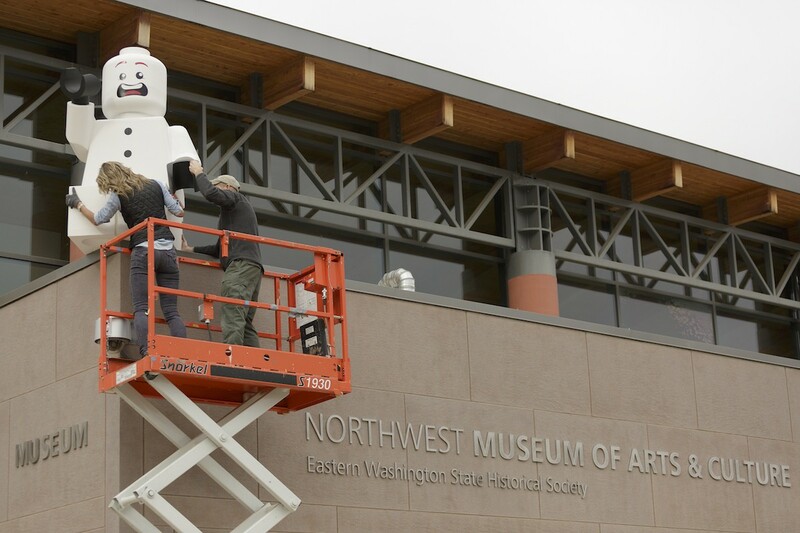 It opens to the public this weekend and you can read all about it in this week's Inlander. While Nature Connects officially debuts this Saturday, Nov. 14, a special sneak-peek sponsored by STCU on Friday evening lets members of the local credit union take an early look by showing their STCU credit or debit card at the door. Kenney's mindblowing Lego art is only on display through February 7, so don't wait too long to get down to the MAC to check it out. Also showing alongside the professional artist's work are the creations of local Lego innovators as part of a sculpture contest that's paired with the exhibit. To get excited for the exhibit and to feel some warm fuzzy nostalgia that beloved toys such as Legos bring out us older folks, check out this endearing Lego TV commercial below. The girl-friendly Lego ad almost made this writer and childhood Lego freak tear up a bit. Without getting deep into the company's past marketing missteps regarding boy vs. girl sets, I have to say this ad is awesome because it effectively realizes that reaching out to girls and parents of girls doesn't have to involve all things pink and princess-y.